What is believed to be Ireland’s first minimally-invasive heart bypass operation using robotics has been successfully carried out. The operation was performed by cardiothoracic surgeon Vincent Young at the Blackrock Clinic in Dublin. Those undergoing the procedure have less pain and a quicker recovery as only small surgical incisions are required. Instead of spending a week in hospital and three months off work, it reduces recovery time to as little as 48 hours and a patient is usually back at work in a matter of weeks, Mr Young explained. The robotic coronary artery bypass graft (CABG) was carried out using “a da Vinci XI robot and surgical system”. Up to 2,000 CABGs are carried out in Irish public and private hospitals every year. “The robot translates the movements of a surgeon, giving them added dexterity, and allowing approaches at difficult and unnatural angles, all through a small incision,” he said. Coronary artery bypass grafts are one of the most common heart surgeries performed around the world since they began in the 1970s. While non-invasive use of coronary stents and angioplasty procedures are now effective for many patients, cardiac surgery is the best option for a category of more seriously-ill patients, Mr Young said. The advent of a minimally-invasive CABG “is game-changing for the survival and recovery of patients”. 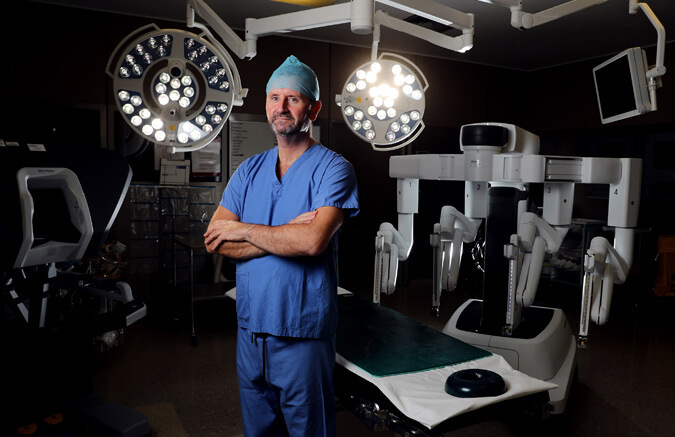 While there were a range of robotics now available for surgery, Mr Young said the operation he performed recently was made possible following extensive training in Ireland, France and the UK, but especially arising from technical ability built up while operating in lung cancer cases. This form of the operation reduces pain significantly in the first instance. “Pain often translates into complications, but with reduced pain, patients can recover much quicker. It is hoped that in many cases patients will be discharged within 48 hours, rather than seven to 10 days, which is standard recovery time for open bypass surgery, and can return to work much earlier,” Mr Young added. One of the robot’s clearest advantages in this procedure is the assistance it offers a surgeon in the harvesting of a key artery known as the “left internal mammary artery”. One end of this artery is then grafted to the artery on the front of the heart, known as the “left anterior descending (LAD) artery”, restoring blood supply to the heart. “For many heart disease patients, there may be more than one narrowed artery. However, the LAD artery is the most important by far and the one associated most commonly with fatal heart attacks,” he added. “While stenting has become increasingly successful it is still recognised that for a subset of patients, the survival can be significantly helped by a surgical coronary heart bypass,” Mr Young said. “Crucially, this type of graft stays working indefinitely, unlike vein grafts from a patient’s leg. Also, it prevents the development of coronary artery disease in the vessel beyond the graft,” he noted. With courtesy of the Irish Times.